Did the tour manager of rapper Post Malone quit because he smells like expired milk and moldy cheese? 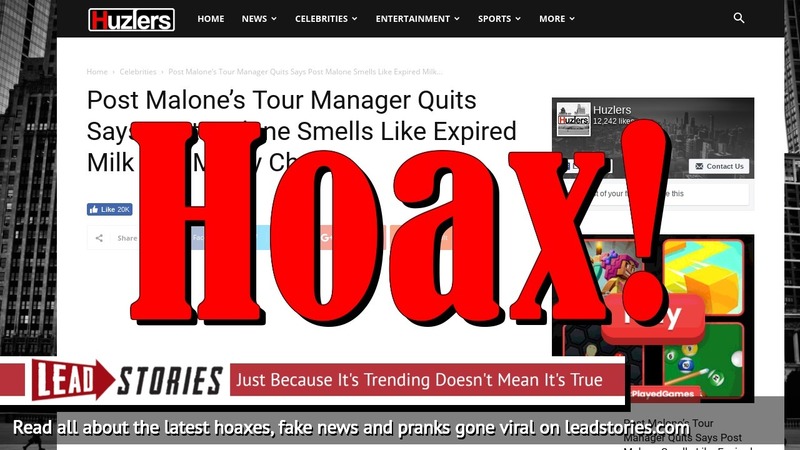 No, that's not true: the rapper did say in interviews he doesn't wear any deodorant but the story about the manager comes from a known "fauxtire" site that publishes made up news with a tiny satire disclaimer at the bottom. So that part is not real. In a recent interview, the 23 year old rapper explained that he REFUSES to wear ANY deodorant. During the interview, Post said, "I smell good...I won't wear any deodorant or anything, but I have a musk.". Most recently a fan vomited during a meet and greet saying the rapper smelled like cigarettes and dirty laundry. Rumors of the rappers bad smell have been circulating the internet for a long time but they were just that RUMORS however now his tour manager has quit due to the rapper intensively bad smell. He claims the smell has gotten worse because the rapper hasn't showered in months!